There are 2 ADS Dash systems. ADS is a data acquisition system using Magnetic sensors or GPS technology to get lap times and speed per lap (ADSGPS Only). It stores the layout of the run trajectory to be analyzed later with our APP or free software. it is provided with a G-Force sensor to increase the accuracy of analysis. The ADS is a compact system that will give you full satisfaction, it is autonomous , the setting is very simple and without wiring. Can be used for training session with young drivers / riders where race line overlays per driver is done on the free software. 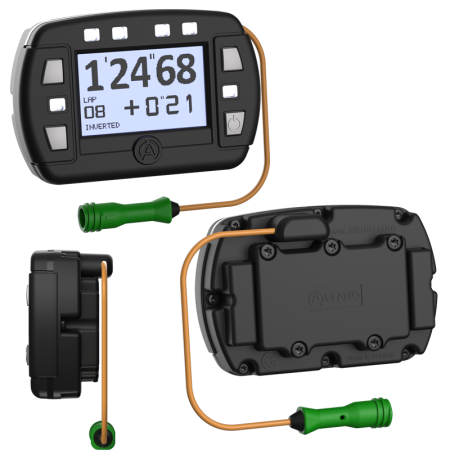 The device and be used also on Track Days, Rallies (Road Time and Stage Time) Slaloms, Trials using the preinstalled modules in the firmware. Mini stand-alone display with integrated GPS. These are ideal for track day riders / drivers. Can put 3 drivers on to the device. Download data to App and share with other drivers. Great for instructors. 2 Led's flash for speed Pos. The use mode is exclusively based on the magnetic strip. Efficient and accurate, it is the cheapest onboard data acquisition system of our range. It is ideal for rental, indeed, possible to lock buttons avoids mishandling.